It is often said that laws are like sausages: you don’t want to see how they are made — you just want to enjoy the end product. In many ways, theatre is equally like sausage — the end product is enjoyable, but the manufacturing… that’s another story. Last night we saw a World Premiere production at the 2015 Hollywood Fringe Festival (FB) that explored the manufacturing process: it took you behind the scenes to see how the theatrical magic is made. OK, well maybe not magic, perhaps just the illusion. OK, well maybe not the illusion, just a crumbling façade. Last night’s show at the Lounge Theatre (FB) was Merely Players (FB), a new musical play by James Penca (FB) [book] and Alex Syiek (FB) [music and lyrics] produced by the Color & Light Theatre Ensemble (FB). Merely Players tells the story of Boyle Community Players/FB, a fictitious theatre company out of Boyle Heights. Past BCP shows have included (in a wonderful bit of inspired backstory): Waiting for (a Werewolf named) Godot, Damned Yankees (in Hell)! ; The Little Prints; Greece! The Musical; Saturday Night Malaria; Fifty Shades of Blue; The Catcher in the Rye: A Rock Experience, and more. Their latest production is “Bus Stop: The Musical“. Now, not that Bus Stop. This Bus Stop is a painting by Max Ginsburg (click here to see it). The artistic director of BCP, Parker (Courtney C. Reed (FB)) has attempted to turn it into a musical based solely on the image in the picture, imagining the character’s lives and motivations that brought them to this point. Translation: She’s not only the artistic director, she’s the writer and producer and choreographer as well. Merely Players provides us with the early days of the life of this musical, from the auditions through opening night and the first review. This includes temperamental actors, constant changes, personal crises, showmances, and the typical stuff that goes on backstage. It also includes a conceit seemingly drawn from The 25th Annual Putnam County Spelling Bee: it draws a out number of audience members to audition. Better have your performing resume handy and be ready to perform (although the songs are simple: Itsy Bitsy Spider, I Have a Little Teapot, Twinkle Twinkle, Happy Birthday, etc). As one might expect, most of the audience members get rejected, but two actually make it into the cast, and one gets a starring role. As such, the play incorporates some elements of the edge of improv, as the scripted actors cannot predict how the audience member will react, their skill level, or what they will do. About the only advantage they have is that they are performing this in Hollywood at the Fringe. That means they’ve got a good chance that their audience member is an actor or someone involved with the industry who can improvise (good thing I didn’t volunteer — I can’t sing, I can’t dance, I can’t memorize lines — although my resume is online). I won’t go into all the trials and tribulations of the show — watching them is a lot of the fun. I certainly can’t comment as to their accuracy, as I’ve never been on-stage or off. I can say, however, that if what was portrayed was true, it finally gave me some needed insight. One of my continual confusions has been the role of the director. To me, an audience member, I always thought that the actor came with the skills (or should that be skillz) to create the character from the printed page — to be able to determine the motivation, the characterization, the accent, the movement, and such. One thing that Merely Players illustrated is the role of the director in that process: being able to guide the actor into the desired portrayal they see in their head. This insight was very useful, although it is still hard seeing the finished product to be able to tease the contributions of the director from the contributions of the actor. There was the fictitious story of the Bus Stop painting and its characters: the Mexican Guy, the Black Guy, the Walker, the Old Lady, the Business Woman, the Girlfriend, the Student, the Single Dad, the Cripple, and the guy in the Baseball Cap. As you can tell, their characterizations weren’t deep. In fact, most of the characters didn’t even have characterizations but caricatures. There was the story of the actors playing the characters (and, alas, the program handed out does not provide that mapping; I attempt to indicate it below with ⇒): Glen, Rene, Kiley, Delaney, Sonny, Addison, Len, Jamey, Hunter, and Cecil. Here we got to see the real-life actors creating various types of characters: the stage manager, the new actress, the over-eager chorine, the gay guy, the professional black man, the good looking musicians. Hmmm, as I write that up, we see that each of the actors in the stories was an archetype, with the director attempting to draw out a non-archetypical performance. The bulk of the story — and most of the humor — comes from this process. It also comes from seeing the interaction between these various characters, especially as they go through the stress of attempting to mount a play that is already f*cked. Lastly, we had the real life actors playing the fake actors playing the characters. The director, Joanna Syiek (FB), who also served as choreographer, did a good job of illuminating this process while performing it herself. Specifically, she seemed to draw realistic archtypical performances from the acting ensemble, making the movement work and seem realistic given the limited 2015 Hollywood Fringe Festival (FB) rehearsal time. She was also able to make the characters appropriately flawed, so that we could see the character of the director actually direct the real actors as actors to become the characters the actors had to become. Confused yet? I found the performances quite good. In the “lead” position (at least of Bus Stop – The Musical) was an audience member, Erik Przytulski (FB), who was actually the writer, composer, and lyricist of Alien vs. Musical (FB), another 2015 Hollywood Fringe Festival (FB) production. Whether this qualifies as a “plant” is unknown; however it is clear that Erik is a person that is more comfortable behind the scenes than on the stage. As a result, he captured the “deer in the headlights” quite well — not remembering his lines or the songs, and not quite being in character. It was fun to watch. Dance and movement were under the choreography of Joanna Syiek (FB). Both the music and lyrics were by Alex Syiek (FB). This really wasn’t a musical as such; there were one or two songs ostensibly from Bus Stop – The Musical that were reasonable; there was no music specific to Merely Players that served to illuminate character, serve as an “I want”, or do anything else to move the piece along. Mitchell Webb/FB was the assistant director and provided additional choreography. As noted earlier, Jennifer Lin (FB) was the musical director. Turning to the technical side. The set design was by umm, well, there’s no credit in the program, which corresponds to the lack of a set design other than some tables, some boxes, some chairs, and the painting. Still, it worked for a Fringe show. The lighting design by Brandon Baruch (FB) was mostly white, as would be the case in a rehearsal room, although there were some places where some blue washes were used effectively. The sound design by Corwin Evans (FB) didn’t stand out, which is a what a good sound design is supposed to do — I’m presuming there were some special effect sounds somewhere. There were no credits for costume design or makeup; presumably costumes came from the actor’s closets and they did their own makeup. Chiffon Valentine (FB) was the stage manager. 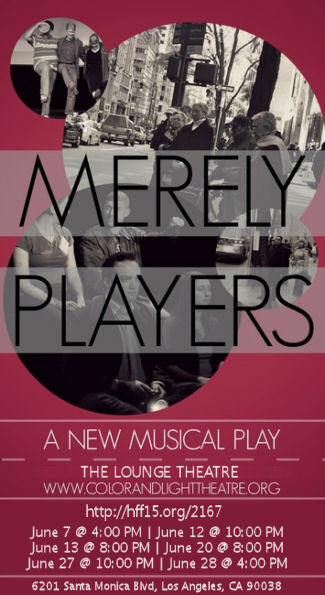 Merely Players (FB) was produced by the Color & Light Theatre Ensemble (FB), a group I had never heard off before. That’s too bad because they have done some shows I would have liked to have seen, such as Things to Ruin or See Rock City. I’ll have to keep an eye on them. Merely Players (FB) has one more weekend of performances at the 2015 Hollywood Fringe Festival (FB), although I hear rumors they may be sold out. Check their ticketing page on the Fringe website to see if any tickets are available. Although I didn’t find it quite as laugh out loud funny as some of the other shows, I thought it was quite enjoyable and entertaining. ← Previous Previous post: I currently have within my reach the sum of Forty-Two Million United States dollars…. Next → Next post: And For This They Named A Sandwich After Him?